Ok, so it works for spelling. The whole alphabet thing actually works just fine for…you know…words and things. But where “A, B, C” doesn’t work is for prioritization. One common thing to prioritize is your workload. Specifically your to-do list. Most people learn that A B C (or 1 2 3, or High Low Medium) prioritization is a way to work through important tasks, a quick way of deciding in what order to do things. But if you are a typical busy professional, chances are that everything you’ve written down is important. Probably the whole reason you wrote them down was because they were weighing on your mind and you were afraid of forgetting them. And the things that aren’t important don’t even make it onto your list. 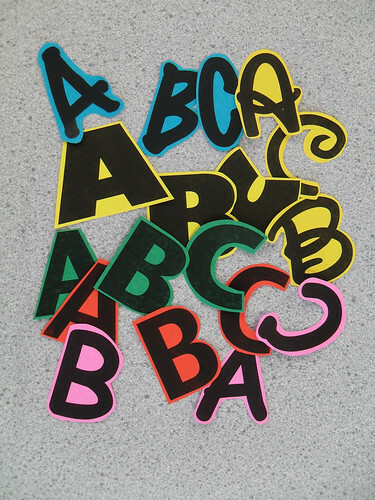 So most everything gets an A, and if you do happen to list some B’s and C’s, they never get done, unless and until they have to get changed to an A. So then what’s the point of prioritization? A B C doesn’t work. In my 17 years in the productivity training industry, I’ve learned that the only thing that works with regard to prioritization is ordering by due date. The dates are usually arbitrary, assigned by you with no particular association to that date except for the fact that it’s the date you’d like to have that item completed. Which is fine. Some people make the mistake of then entering the task on their calendar for that arbitrary due date they selected. All this does is artificially clutter your calendar. We’re always overly-optimistic about all the things we can get done in a day, and so then you’re faced with the task of having to remember to move the things that you neglected to do on a given day, to tomorrow. This is a bad idea for several reasons. First, tomorrow has it’s own agenda. Also, it sets you up to start the day focusing on the things you failed to accomplish yesterday. Not very motivating. Finally, there will come a time when you forget to move something that you didn’t do. And then it won’t get done. This is called “slipping through the cracks,” and you want to minimize the potential for that to happen. So, prioritize by due date, but don’t use your calendar. Here’s what I suggest…use a to-do list for all of your things that need doing, that don’t have to happen on a particular date. (I recommend an electronic tool rather than a paper one, and for more on that, read this.) Assign a due date to the task: the date you’d like to complete that item. You’ll be tempted to put “today” for many things but it will quickly become apparent that there are only so many hours in the day. Also take a look at your calendar for that day. If you have a lot of meetings, it’s unlikely that you’ll also be able to complete a long list of tasks. Inevitably, you’ll assign too many tasks to a given due date, and once that dates passes, the task will turn red (in most electronic tools). But that’s ok. The next day, you can take a look at your “red” (overdue) items, and re-assess them with regard to the items you’ve assigned to that day. What seemed really important yesterday might seem much less important today, in light of what’s going on today. Or it may still seem very important and make you realize that some things that were scheduled for that day now have to get bumped. After a few days’ time, you’ll realize approximately how many things you can complete in an average day. So you can parse your to-do list out accordingly. For example, let’s (oversimplify for the sake of the example and) say you have 25 things on your to-do list. All of them would seemingly be an “A” priority. But now you know that in an average day, with meetings, interruptions, etc., you can only actually complete 4 or 5 tasks. So 5 tasks today, 5 tasks tomorrow, and so on, means that some of those “A” priorities aren’t actually going to get done for at least five days. This is when reality hits you over the head and you are forced to recognize that you have to make some adjustments: cancel some meetings so you can get more tasks done in a day. Work more hours (at least now you can plan). Get help. Request extensions on deadlines. Etc. Knowing whether reality is actually going to conform to your idea of what should happen, gives you many advantages: it helps you to head off potential crises, it allows you to plan appropriately, it reduces your stress, which is often caused by the pressure of trying to get everything done, wondering whether you will, and imagining what bad things will happen if you don’t. Prioritizing by due date helps you to take a long (and sometimes overwhelming) list and focus only on the most critical things for that day, while still being in complete control over everything else that isn’t be done, so you aren’t stressing over it. To read about the other components that I think are necessary for a complete set of personal productivity tools, you may be interested to read Owning Clubs Does Not Make You a Golfer .